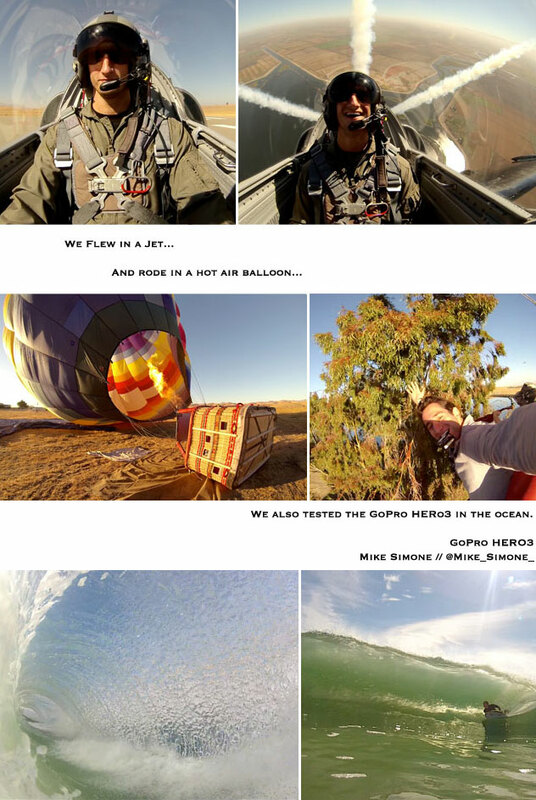 GoPro cameras recently held a “Secret Media Adventure” trip in the San Francisco Bay Area. Over 60 editors, reporters and writers were invited to try and test their new cameras during an AIR, LAND, or SEA adventure of their choice. Our on-the-scene Associate Editor, Mike Simone got first-hand experience with the new camera, so here’s what he thought—and what he captured. Check out the product review below, then hop over to Page Two for images from his adventures. When you’re really into a sport or activity, you always get that “pit of the stomach” feeling of anticipation or pure stoke. Whether it’s surfers and bodyboarders watching their friends in perfect surf conditions, snowboarders and skiers trading off to slash through the freshest of powder, or the casual outdoorsman enthused about a mind-blowing sunset, we never want that feeling to go away. The new, smaller, lighter and faster HD HERO3 by GoPro is the device to capture whatever it is that gets your adrenaline pumping, keeping those amazing moments alive forever. Here’s why. GoPros were made to be easy to use, and you don’t need to be a professionally seasoned photographer or videographer. All you need is a little bit of creativity and the ability to navigate two buttons—power on/off and record on/off. Of course, there are more features to learn, like shooting still images vs. video or burst capture vs time lapse, but in all honesty, it will take you 30 minutes—tops. One of the coolest things about the GoPro is that—once you realize you can do with it—your mind immediately flows with creativity. Things you would have never thought would look cool on video look amazing, especially with the fish eye lens. And after you’ve got it on camera, you’re even more energized and excited. If you’ve got a creative idea for placing the camera somewhere, GoPro probably thought about it and created a mount for it. All kinds of boards, bikes, helmets, poles, cars, planes—you name it, you can mount it. GoPro does come equiped with everything you would need to make any day an adventure, but there are some additional items you might want to check out. The GoPro Wall Charger is an absolute must have especially for the on-the-go guy. To make sure you “get the shot”, certaintly check out the GoPro LCD BacPac and if you’re looking for some cool angles, pull back shots, or need to stay out of harms way, grab the DSLR/POV Handheld Monopod from Quik Pod.